THIS ITEM: Wonderfully detailed fantasy image of babies to the rescue on their tall ladders.edge/corner wear. Unused, Very Good . THIS ITEM: Signed at lower right, an elegant 'fade away' image of a couple in evening clothes. Just a touch of wear.Unused, Very Good . MINT- as if freshly printed (rare).EXCELLENT- with only light corner/edge wear.VERY GOOD- may have corner/ edge wear, light marks, light surface wear, light soil, light bends/creases.GOOD- may have corner/edge wear, moderate marks, moderate surface wear, moderate soil, moderate bends/creases and other imperfections as described. VINTAGE POSTCARD POSTMARKED VOTS DER USE OF EATING VEN MINE HEART ISS HUNGRY FOR A LETTER FROM YOU VONCE YET. VINTAGE POSTCARD POSTMARKED MY HEAD IS FULL OF THOUGHTS OF YOU UND IF YOU VONCE VAS HERE I'D VEAR THOSE SMILES WHAT DON'T BLOW OFF LIKE BUBBLES ON DER BEER BY A.M DAVIS CO QUALITY CARDS BOSTON MASS. 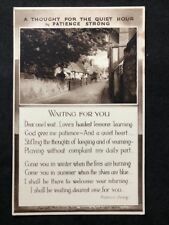 VINTAGE POSTCARD POSTMARKED EVERY NIGHT VEN I GOES BY MY BED I DREAM OF YOU SOMEDINGS WHAT I VISH I HAD SAID. C.S. 428 BY SAMSON BROTHERS. VINTAGE POSTCARD POSTMARKED I VANT TO KILL SOME LITTLE TIME YET MEET ME IN … VERE DE PILSINER FLOWS, VILL YOU?. I am available. - Checks are accepted only in France. VINTAGE POSTCARD POSTMARKED 1909 BIRTHDAY GREETINGS BY AMERICAN NEWS COMPANY NEW YORK BERLIN LEIPZIG. VINTAGE POSTCARD TO WISH YOU JOY AND BIRTHDAY CHEER, AND PLEASANT TIME THROUGH ALL THE YEAR. BY F.A. OWEN CO DANSVILLE NY. VINTAGE POSTCARD POSTMARKED A BIRTHDAY WISH MAY YOU EVER TRAVEL FORTUNES ROSY WAY. VINTAGE POSTCARD POSTMARKED WERE HAFING A GOODT TIME, VISH YOU VERE ALONG! VINTAGE POSTCARD POSTMARKED WERE HAFING A GOODT TIME, VISH YOU VERE ALONG!. Has a few knocks to the right edge. Get images that. Material Paper. The actual color may be a little difference from the picture. Color Random. 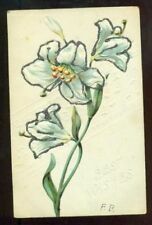 VINTAGE POSTCARD POSTMARKED 1915 HUST MAKE A FELLER CHUMP MIT CHOY BY PENNING HIM SOME SENTIMENTS. BY BERGMAN. Signed Capt A Davidson. make Supersized seem small. Get images that. When Buying More Than One Item use the. "Request Total" Button. My Zie Compleanno. 2 Bella 1930's Vero Foto Compleanno Greetings. Mio compleanno zie. Type High Gloss Real Photographic. Size Standard (140x89mm). VINTAGE POSTCARD MAY THS BIRTHDAY BRING HAPPINESS AND EVERY JOY THAT LIFE CAN BLESS BY F.A. OWEN CO DANSVILLE NY. VINTAGE POSTCARD POSTMARKED VALENTINE GREETING DIS ISS IT HERE IT ISS: IT'S YOUR'S FOREFER MISS. C.S.410 BY SAMSON BROTHERS.